I read a blog post last year that reminded me all over again how great the iPad can be as a tool to create with. iPadArtRoom is a great blog with lots of ideas and explanations on how to use the iPad in an educational setting. In Ink Blot Monsters, Visual Art Teacher and Apple Distinguished Educator, Cathy Hunt shared a sequence of activities where her students used iPads to blend hands-on tasks and digital media. Off I raced to the App Store, as usual super excited about a new app that promised to be a useful tool for digital storytelling. What I liked: Because I'm somewhat of a feather-brain, and always in a hurry, I LOVE apps that are easy to use from the start. The DAILY MONSTER Monster Maker is intuitive AND supplies a quick and comprehensive tutorial on the app. I was up and running in seconds, having a lovely time creating various monsters by "blowing" ink and adding extra features. Kids are going to enjoy this process, with lots of customising available to create their own special monsters. There's also a way to get the app to generate a monster for you, making it useful for younger kids who may not have the manual dexterity to pinch to re-size elements etc. Be sure to point out to kids that the body part menu also has scrollable arrows for more available elements. They can use their iPad camera, in-app, to photograph a monster against a background in their environment, then save the image to the camera roll or email it. What I did to make a digital story: Increasingly, I'm enjoying what I think of as the app+app process. That is, starting a creation with one app, then modifying or adding to it in others. 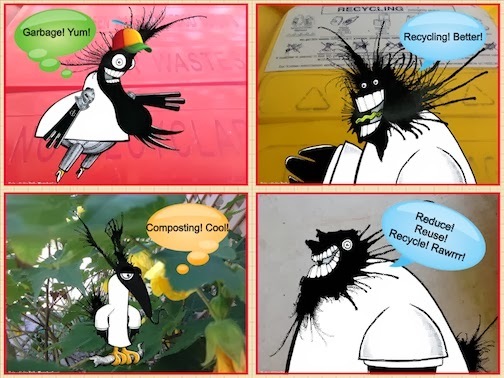 After I had created a couple of different monsters and photographed them outside my house, I decided to have my monsters share an environmental message in four comic panels. For this I used an app called PhotoComic for iPad. In PhotoComic you can choose a layout, photos, add text, and stamps include speech bubbles. At top, you can see my resulting four-panel comic, using images created in The Daily Monster Maker. PhotoComic: iTunes Australia $0.99 but with extra in-app purchases, iTunes USA $0.99 but with extra in-app purchases. NB: Get an idea of DAILY MONSTER creator, Stefan G. Bucher's skill in this post.